Clothing is a sum of its parts and no garment exists in isolation; its legacy and provenance are integral to its place in our lives. As much as we endeavour to reduce and reuse, we will continue to have things - so knowing their origin is more relevant than ever now, in this time of murky supply chains, unsustainable growth, and environmental reckoning. It is with this all in mind that I headed to India. My trip to the small town of Bagru in Rajasthan started with a dress I bought from the label Penny Sage. Designed by Kate Megaw, her designs are all sewn in New Zealand by a handful of trusted and skilled machinists. 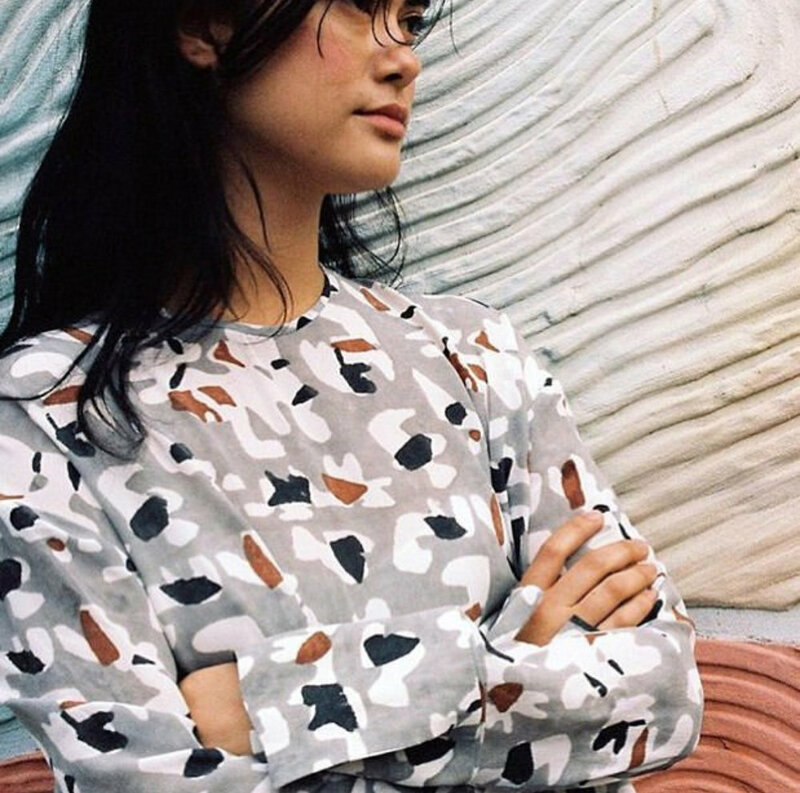 The silk of the dress features an earthy, stone-like pattern in grey, brown and black; it’s a print that intrigued me from the very first time I saw it, and one that was designed by textile artist (and frequent Penny Sage collaborator) Marta Buda using paper collage, inspired by Jean Arp. She and Megaw were intent on using a traditional process for the final print: the technique of Indian block printing. For that they turned to Bagru Textiles, a business that utilises traditional block printing and natural dyeing, and the result is a pattern that feels pure and free, with a keen sense of all hands involved in its creation. All above images from Penny Sage. Top left, Marta Buda by Greta Van Der Star. Bottom left, Bagru Textiles at work. It’s a dress I have worn again and again over recent years, and I naturally brought it with me when I travelled to India for seven months - its loose shape and earthy pattern proved ideal for the heat and dust. It is this dress that I’m wearing when we disembark in the small town of Bagru to meet Vijendra Chhipa who runs Bagru Textiles, a family business he took over from his father. He works with designers around the world to translate their pattern designs into woodblock printed textiles, and greets us warmly at the gate. The doors open to reveal a dusty expanse of ground stretching out under the bright morning light; large blocks of colour, vibrant pink, mustard and deep indigo, fill the space and the effect is nothing short of arresting in its scale, saturation and geometry. 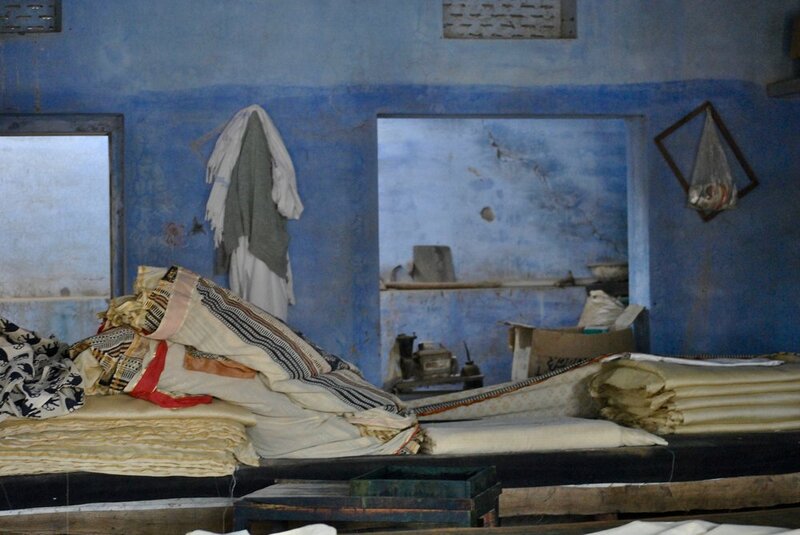 This communal area is where the local dyers and printers of Bagru dry their fabric. With sun above and sand below, that process is fast. Life shifts and bends to the seasons in India; when the monsoon rains come, fabric can no longer be dried in the square. A town of around 31,000 people 32km from Jaipur, Bagru is home to the Chhipa community and it is they who maintain the industry of block printing and dyeing here. Their name is tied to their craft; "chhi" (to dye) and "pa" (to leave something to bask in sun). These two processes give them their livelihood, a tradition that dates back at least three centuries. The jobs the industry provides extend beyond the printers, dyers and craftsmen to those involved in marketing and distribution. Bagru Textiles works closely with several families who specialise in different parts of the process (all conducted by hand) from the carvers of the woodblocks used for printing, to those who create the inks, print the textiles and dye the fabric. Each specialty requires a high level of skill. It can take days to carve a single wood block and many weeks to ferment certain dyes. We witness first-hand the alchemy of dyeing; vats of horseshoes ferment and foam - visceral and primordial, metres of cotton are submerged and brought to the boil, turning to red. The majority of the dyes used by Bagru Textiles are natural - specifically black, red, brown, grey and blue - and the process of acquiring these hues requires a great deal of time and effort, a far cry from the ease and speed of synthetic options. All fabric is first soaked in harda. This pre-mordant is a natural astringent, the yellow paste made from the dried fruit of the myroballan tree. Black comes from kut, a combination of jaggery, water and the fermenting waste iron we witnessed. Seemingly colourless, once transferred to the harda-soaked fabric via woodblock it turns a deep, inky, magical black. Grey comes from alum. Blue is from natural indigo, and this plant-derived colour a signature of the region’s textiles. For red, begar paste (a mordant) is first applied and once boiled in alizarin dye these areas turn a rich red. Mud resist printing is also fundamental process to printmaking. The mixture, dabu, is made from wheat powder, guar gum, lime and clay. Once applied to fabric, it is sprinkled with sawdust and left to dry. When the textile has been dyed, it is removed by washing to reveal a pattern untouched by dye. The effect of all this is textiles possessing soul and history. The hands of the makers leave an impression, no matter how slight. It’s a harsh cry to materials produced in this current age of digital printing and high-tech knits. The block printing and dyeing conducted here work within parametres that make them naturally suited to more a intimate sustainable scale of production; an inherently manual process, meterage can not exceed what the dyers can physically lift. The trade of the Chhipa has endured through many generations, and provides the main economy for the small town. Manufacturing processes like these warrant value and respect, proving especially relevant as we seek to make considered choices with our production and consumption of textiles. Bagru Textiles have made a point of working with designers around the world, to give their trade visibility and value, opening it up to new audiences who are seeking authenticity and craftsmanship. They also run printing workshops for visitors, as a way of sharing their craft and history - reinforcing the importance of slow processes - and adding income to their business and community. In a small community like Bagru, environmental issues cannot be ignored and they must work with sensitivity to their surroundings. Water is scarce, and the water table has dropped dramatically within a single generation due to environmental change in the region. Their use of natural dyes means water can be safely reused on their crops, minimising waste. Approaches like that of Bagru Textiles are, unfortunately, the exception not the rule. With a huge domestic and international demand for cheap textiles, large-scale manufacturers have had a brutal impact elsewhere, with untreated runoff from synthetic dyes polluting water sources, land and crops. Many of have proven toxic and even carcinogenic to workers. It’s estimated 20 percent of all freshwater pollution comes from textile treatment and dyeing. It’s not only water and land affected, air pollutants are also emitted during industrial dyeing and manufacturing - particularly harmful to workers. Leaving Bagru, I couldn’t shake a sense of fragility. India is a country in the midst of huge economic shift (why else are H&M and Walmart circling). Once gone, whether through industrial development or environmental factors, this small, special corner of industry will be gone forever - and its precious skills with it. It can’t be denied that the overconsumption and rampant consumerism encouraged by the fast fashion and its race to the bottom line have had devastating effects on everything from the environment and health of works to artisan traditions. The skill, tradition and ethos of businesses like Bagru Textiles and the town of its namesake present a past, a future and a choice.